Frazier Dailey talks about antique and vintage tractors, discussing their history, the major manufacturers, collecting trends, and events for tractor enthusiasts. He can be contacted via his website, Antique Tractors Forum. 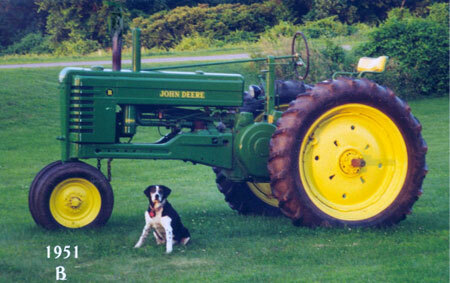 I started collecting antique tractors in 1971. I’ve owned several old tractors over the years and always wound up selling them to somebody else—all but this one old 1938 Case. That old Case will never be sold. I drove that same tractor when I was five years old, sitting on my daddy’s lap, and it’s just not going to be sold. Its name is Samson, and I bought it in 1966. I was farming at the time, so I used it to plow corn, rake hay, feed cattle, that kind of stuff. I’m called the Case man because of that old Case. My local grocery store does displays in the produce section, so I asked them if they’d like to have a tractor to put in there, and they said sure. Before I drove it in, I measured the doors. I only had a half inch on either side, but I’ve driven that tractor so much, I can almost shut my eyes and do it. I drove it right in, parked it, and it sat in there for about two weeks. It drew a lot of attention. People just came in and stood and looked. The store called me back and said they want to do it again, so as soon as I’m done with some shows, I’m going to bring it back. 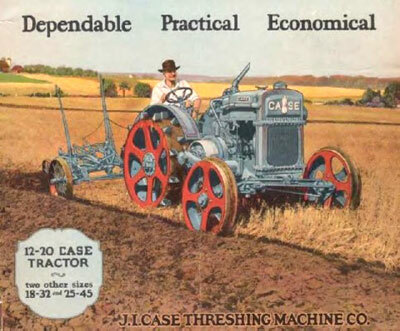 My favorite tractors are Case. I think the round-nose Case was one of the prettiest tractors, and the 40s series tractors that they made were awfully pretty, too. Right now, I’ve got two big tractors and two small ones. 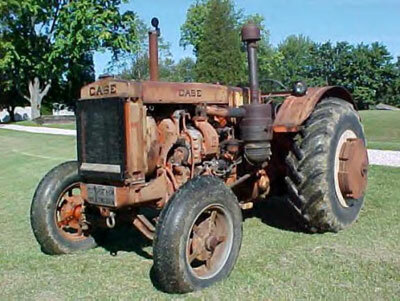 I have this 1938 Case, 1969 and 1970 Case garden tractors, and a 1946 Massey-Harris that I bought last year. I bought it to resell but I liked it so much I kept it. I have a shed that I keep the old Case in, and right now I’m working on the Massey-Harris, so it’s sitting out in my back yard with a parade wagon that I’m also working on. I use the parade wagon for parades and hay rides. When I do the fun runs, there’s always someone wanting a ride, so it works for that, too. My wife likes to ride with me, so she rides in there and people ride with her. It’s a lot of fun. It’s a family thing. I’ve also got a vintage hay bailer that probably came out in the early 1950s. It’s just like the first hay bailer my dad had, and that’s why I wanted it. The only thing I need to do is just clean it up and paint it. I’ll get that done either this year or next because I want to start showing it behind my tractor. Tractors started right before the turn of the 20th century, but they never really made a big impact until the 1930s. Most of the big companies started making war products. Some made tractors for the wars—Case did, John Deere did—and some of them even made bullets and bombs and all that, so it was hard for a farmer to buy a tractor back then. There were no new tractors being made, so there was a shortage. Then they got back up on their feet and people started replacing their horses with tractors. One company would buy out another company and merge with yet another. When they first started making tractors, they had steam engines. People still collect steam engines today. Steam engines went on prairie tractors, enormous tractors. When they made those big old tractors, only the richest people could own them. In the 1900s, most tractors ran on kerosene. Then, in the middle of the 1950s, they started on diesel instead of kerosene. Diesel tractors were a lot cheaper to operate than gas at the time. They lasted longer. They were more expensive to overhaul, but in the long run they were just cheaper for the farmer to use. 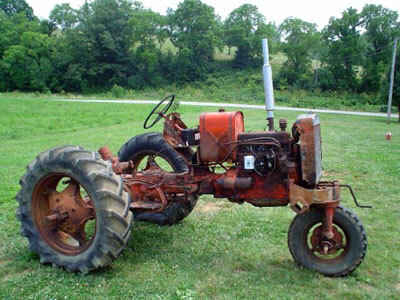 In the 1930s, tractors were what are now called “unstyled tractors.” They were just made for use and that was it. A lot of them were painted the same color, just all grey. 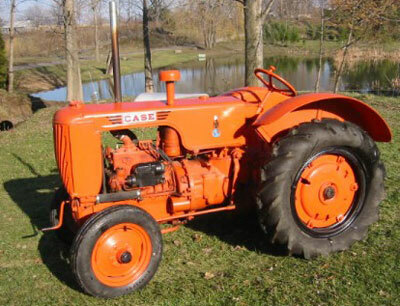 Then Farmall went to red, and in 1938, Case styled their tractors and painted them Flambeau red, which is a reddish orange color named after the Flambeau River. Bright reds became popular because in those days people were driving the tractors on the road and they wanted a color that could be seen easily. They put sheet metal on the hoods, and a lot of companies put skirts on the motors to hide them. All the manufacturers tried to really dress their tractors up and make them look good because they realized a farmer was just like a guy behind the wheel of a car—he wanted the pretty one. 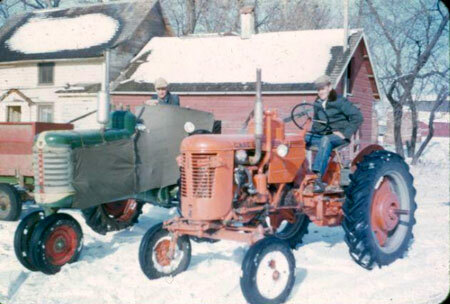 Most people restore their tractors themselves, but there are also collectors who hire people to restore them. Sometimes it may take five or six years to restore a tractor. As a matter of fact, we’ve been working on a 1941 Case for four years now and I just finished getting the last of the parts for it the other day, so hopefully we can finish it and start showing it this year. Parts are hard to find for some tractors. Sometimes you have to hold out until you find the part, and sometimes you have to actually make the parts because they just don’t exist. Some companies don’t make reproduction parts, so if you can’t make it yourself you have to find somebody else to make it. It could be a steering part or a motor part. Sometimes you have to make your gaskets. Manifolds are also hard to find for certain tractors. You may have to find somebody who’s got the part you need and see if they’ll let you borrow it so you can copy it yourself or have it made. Generally you can find motor parts, but sometimes sheet metal is hard to come by. The sheet metal on the fenders of orchard tractors is awfully hard to come by. I’ve made some sheet metal parts, side panels and stuff like that. Right now I’m hunting—and have been hunting for a long time—for headlight brackets for a Massey-Harris 20. I can’t find them anywhere. I have one but I need three. Some stuff is cast, like these brackets, so there’s no way I can make it unless I take one and have it cast, but I’m not going to do that yet because it’ll cost a fortune. We’re also looking for a hood for an Oliver. Now that’s hard to find. We’ve been having trouble, but eventually it’ll show up somewhere. I go on the internet and search for people listing junkyards or selling cars. I’ll also advertise what I’m looking for on my website. Some people put up the stuff they got for sale on my website. There are some companies that make reproduction parts for these old tractors—sometimes you have to settle for a reproduction part if you can’t find the original. Nowadays with the internet, what you’re looking for is much easier to find. I’ve been hunting for three parts for a while now and I found one on the internet. Every day or two, I’ll email somebody asking for parts. Before, you just didn’t have the contacts. You didn’t know who to call or what to do, so that’s made the hobby a lot easier. The only trouble we’ve had was when we got a Case VAC-14 for my grandson. We found it at a barn, and we had to take the barn down around it. We spent all day taking the barn down and then trying to pull the tractor out and get it loaded so we could get it home. There was a book, Tractor in a Haystack, and the first chapter mentions that tractor. It was a pretty hard deal but it’s been worth it. It was his first tractor. It’s still his; he’s never going to get rid of it. It’s just one of those things. The serial number on a tractor is very important. You need a matching serial number on the motor and on the tractor so that you know that the motor is the original motor. Some people won’t restore them unless they’re original with the matching serial numbers for the engine and the tractor. To restore a tractor right, you need the original serial number plate it came with. As a matter of fact, some people take off their plates and put ’em somewhere safe where nobody can steal ’em because people will put them on other tractors. It’s been known to happen. You can buy reproduction serial number plates now, too, but it’s best to have the original still on there. Some people still use the old tractors, especially small-time farmers or the guys that only have a few acres. The new tractors are so expensive, it saves you a lot of money. A new tractor is $30,000 or $40,000, but you can buy an old tractor for anywhere from $1,200 to $3,500. It may not be the best looking tractor but it’ll do what you want to do, no problem. If you want to get a real good antique tractor with everything on it, you can go from about $5,000 to $6,000. Most collectors’ tractors run. I’ve read stories where they will start so many this year and so many next year and just keep them in rotation, but the small guy, he’s starting his every day. A lot of different people collect. There are doctors, lawyers, common people, old farmers. Young people are getting into it now. Some collectors may have hundreds of tractors, some may have one or two, and some might not have any—maybe they’re waiting on a tractor that’s going to be handed down from the family but they’re still interested in collecting tractors. Most collectors that I know have between one and 10 tractors. Most of your collectors are not farmers. They usually have a factory job. They need a daytime job because it gets expensive to collect. Sometimes you can buy a tractor that’s already been restored for cheaper than what you’d pay to buy one and restore it yourself. Sometimes you can find someone wanting to sell one and you’re better off buying it that way and maybe just doing some cosmetic stuff on it. There are female collectors, too. You see almost as many women at shows as you do men. A lot of them have a tractor they show and ride along with their husband, and a lot have their own. I have five kids. Two of them are into it big time, and another has a tractor that she brings to the local show here. My sister lives in Texas and she comes in to bring her tractor to the show. She’s got a trailer that she loads it on behind her motor home. Some of my nephews are into it and they show now. I’ve got cousins that show. So yeah, there are a lot of people in my family that are into it. That’s pretty common. A lot of the families all get into it big time together. A lot of our tractors nowadays are being taken to other countries. Foreign collectors come over here and buy them and then put them in those big pods and ship them. I know a guy in England who just bought a tractor from Kansas. You can ship them all over the world. There are U.S, collectors that buy foreign tractors and bring them back here, too. It works both ways. The Cockshutt is a big one that people here collect; it was made in Canada. They made the same tractor for the U.S. but it had a different name. It’s weird. Rowcrop tractors have two small wheels that sit close together in the front, and that’s so that you can drive those two small wheels down the center of a row and your big back wheels will be in the center of a different row. A standard model would have a fixed front width between the wheels that you couldn’t adjust. You could get a wider front end that was adjustable so you could set it for one row, two rows, et cetera. They also made tractors with just one wheel in the front. Highcrop tractors are real high off the ground so they can spray the crops. A highcrop tractor is really a sought-after collector’s item. They also had rice tractors that were used in the south and they are also collectible. Companies wouldn’t make more than just a few of them. There isn’t really one type that’s more collectible than another. You’ve got people that collect John Deere, you’ve got people that collect Farmall, you’ve got people that collect Case, you’ve got people that collect Massey-Harris, you’ve got people that collect Cockshutt, and some people don’t care about the makers and will collect any maker or model. A lot of people do stick to a certain one and it’s usually the one they were raised up on or someone in their family had one. For me, no matter what, I’m partial to Case tractors. I’ll collect any kind, but I’m still partial to Case. I just can’t stay away from them. As for dates, older people will collect the tractors from before the 1950s and the younger people will collect up to the 1970s and ’80s because those are the tractors they grew up with. The most interesting models to a collector would be the rare tractors, and when I say rare, I mean tractors that were made for only one or two years or tractors that were demonstrative or experimental. They’re worth a lot more money. My Massey-Harris was only made for three years. It was their 100-year anniversary tractor, so that’s the reason I bought that. I look for unusual tractors. Any old farm machinery is considered collectible. You can still buy the ploughs and people still use them. We have what we call plow days: you find yourself a used plow, fix it up, and put it behind your antique tractor and go plow. There’ll be up to 100 tractors in one field. Combines started out as thrashers. You had to cut and bind the wheat or grain and then bring it to the thrasher because it was stationary. Then the combines came in and they were pulled by a tractor. Eventually the combines went self-propelled—they had their own motors so you didn’t need tractors to pull them anymore. People don’t bring combines to tractor shows in my part of the country, but in other parts they do, especially the Midwest. A lot of people collect them. That’s a big collecting thing right now, all types of equipment—pull-type combines, pull-type corn pickers, et cetera. Every once in a while you’ll see somebody in this part of the country that shows them. You’ll still see thrashers at the shows every now and then. Somebody will bring wheat and they’ll thrash it, and they’ll have a stationary bailer just to show people how it works. Collecting toy model tractors is a very big thing, too. I’ve got a son that restores model tractors for people. They have toy shows where you can buy the different models. Some collectors never take them out of the box. You can buy John Deere in just about any of the models. They’ve got all the older ones. Some kids nowadays are collecting models of old garden tractors. John Deere is the only original company that’s left. Now most of the tractors are made overseas and out of plastic. We often talk about these old timers, like my 1938 Case that I can still use. I’m wondering if the new ones will be around that long. It’s very interesting to see what will take place. In this country, John Deere, Farmall, International Harvester, Massey-Harris, Oliver, Cockshutt, and Ford are probably your biggest manufacturers. There were all kinds of configurations of a tractor and different horsepowers. When they first started, they made one tractor, and a few years later they’d improve it and give it a different letter series. There are all kinds of tractor clubs—big clubs, small clubs, local clubs, national clubs. Some will have shows and what we call fun runs, where people will meet up and ride. I do rides for Relay for Life. I don’t charge, I just put out a donation jar. There are tractor plow days and tractor thrashing days all across the U.S. and in England, New Zealand, and Australia. I went to a tractor show in the middle of May. It was pretty good. It seems like the interest in tractor shows is still holding up well. There are a certain number of people that camp out at shows, and almost everybody’s got a dog. Some people have more than one dog and they always come to tractor shows. It’s mostly just getting together, talking, cooking, and playing games. There are tractor games and all kinds of stuff to do. The main difference between a tractor show and a car show is that at a car show, the guys are always polishing their cars and trying to keep people off them, whereas at a tractor show, they just wipe off the tractor and put it in line. Sometimes you may see them driving it, or they may be working on it and repairing something. You’ll see a certain amount of the same people at the same shows in your area. There’s usually a group that follows one another and goes where the others go, but if you travel far away, 100 miles or so, you’ll see a lot of tractors and people that you never saw before. I first showed my Case in 1971. Years later, I took my grandsons to their first show with the same Case. I drive my tractor when I do my own show in Santana. We drive them about six or seven miles. We hook some kind of machinery behind them and drive them on the main roads and highways. You don’t need a license plate or a driver’s license in Kentucky. My grandson drove my tractor 15 or 16 miles on the road some years ago when he was only 15 years old. We don’t usually have any trouble on the roads. When we do these fun runs, we’ll travel 40 miles with our tractors. Last time we went from Lexington, Kentucky to Winchester, Kentucky, which is 43 miles roundtrip. We went to a museum there and had a cook-out. I think we had 15 tractors on that fun run, and we had to go through some pretty tough traffic. My web site was two years old the first day of March 2009. In 2005, I found out I had throat cancer. I did all my treatments and I had my operation, and I decided I would start a forum for other tractor people. I had a lot of friends already through the antique tractor shows so I started this forum. Now I have friends from all over the world. I got people from England who come to my shows and stay with me while they’re here—I never laid eyes on them before then. We’ve grown by leaps and bounds. We never make fun of nobody. We never make fun of people’s spelling. Different parts of the country talk differently and spell differently, but it all means the same thing. If I was just starting to collect antique tractors, I would find something that didn’t need a lot of work—something that was already running that I could just clean up and paint. That’s a good way to start, and then you can dig a little deeper. Your first tractor’s always going to have a special place in your heart, I don’t care if they made a million of them. There are so many different tractor books: there’s a book on how to buy an antique tractor, a book on how to restore it, and another on how to paint it. And then there are books on certain manufacturers. I’ve got a book called 150 Years of J.I. Case that’s nothing but different Case models, when they were made, how to read serial numbers, stuff like that. It’s one of the best books that I have. It’s got everything. (All images in this article courtesy Frazier Dailey of Antique Tractors Forum). What a good piece of writing .You need to write this in a book . I’m so proud to be on The ATF ,I’VE MADE FRIEND WITH SOME OF THE NICEST PEOPLE. THEY ARE FROM ALL OVER THE WORLD.It IS LIKE YOU’VE TOOK A TRIP TO SOME WHERE DIFFERENT EVERY TIME YOU GET ON ATF. i OWE YOU ALL THE THANKS. Great article Jr!! Very nice. Very Nice CaseMan! I really enjoyed this article. I think that you hit on all the high points of our hobby! Anyone whether new or old to collecting old iron would enjoy reading this. I particularly liked the part about the tractor clubs and tractor shows. I think that it is an EXCELLENT idea for new people to get involved in the antique tractor community both in person and online (through ATF). For one thing, it is a godsend for finding those “impossible parts”. We have three old Case tractors on our farm. We’re too old to restore them so are looking into selling them so someone can enjoy them. One is a 1958 Case 400 and another is a ’74 case 2870, and a Case 2590 (1983). My husband says they will run, with work. They do have all original serial numbers. We have them protected in a shed. I’d appreciate any information on what to do with them so they don’t just deteriorate further. They are great-looking but we just can’t use them now. We live in North Mississippi – not far from Memphis. I loved this article and learned a lot from it. I am still looking for one of the first three L Case tractors with GM diesel engines that were made at the GM engine distributor in Wichita, KA in 1947. What are the details of the L Case with the 3-71 pictured in this article? Is it one of yours? This is an excellent article.Caseman sure has a way with words. Can anyone identify please ? I was wondering how much a 1951 dc 3 adj wf would be worth it runs great looks good please email me thank you??? What a great artical. Many thanks for taking the time to put it together..
A great article i have recently bought a case tractor it is an old d series. it runs great and i do have a few things to find for it . But that is half the fun of rebuilding old tractors . Hope to see more from you. I found a multi use tool for a Fordson Tractor. I would like to know more about it or where to find the information. It is a wrench type tool with a large wrench on one end with hooks and a small wrench on the other end. JR, thanks for keeping the site alive. It’s a real life saver for a guy like me. Good information and good stories. Thanks again! Keep well. “ ” Thurston was the magician Houdini wanted to be.